SigMRF is a DPDK enabled high capacity media solution for voice and video applications. SigMRF software allows customers to turn industry standard servers into high capacity media resource servers, providing MRF (Media Resource Functions) for SBC, transcoding, and content delivery applications. 32-core and 64-core CIM PCIe accelerator cards leverage Intel's DPDK to provide high-throughput, low-latency access to data plane x86 cores. CIM® accelerator cards are thin, light weight, and have low power consumption. 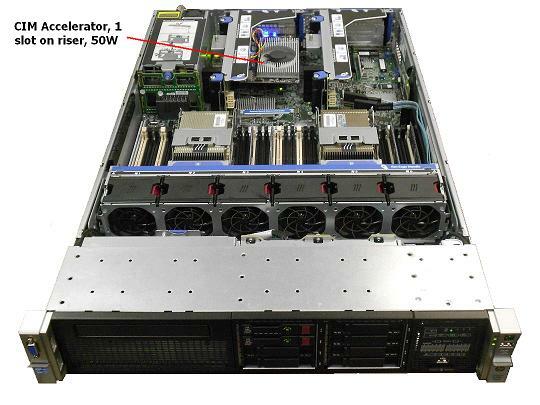 For example, three (3) 32-core cards can be inserted on a single riser in a 2U industry standard server and not exceed the riser power consumption limit of 150 W. A 1U server can be configured for as many as 256 CIM accelerator cores, and a 2U server for as many as 384 cores. CIM® accelerator cards contain direct 1 GbE to 10 GbE network connections for high throughput and low latency media processing, including virtualized systems. 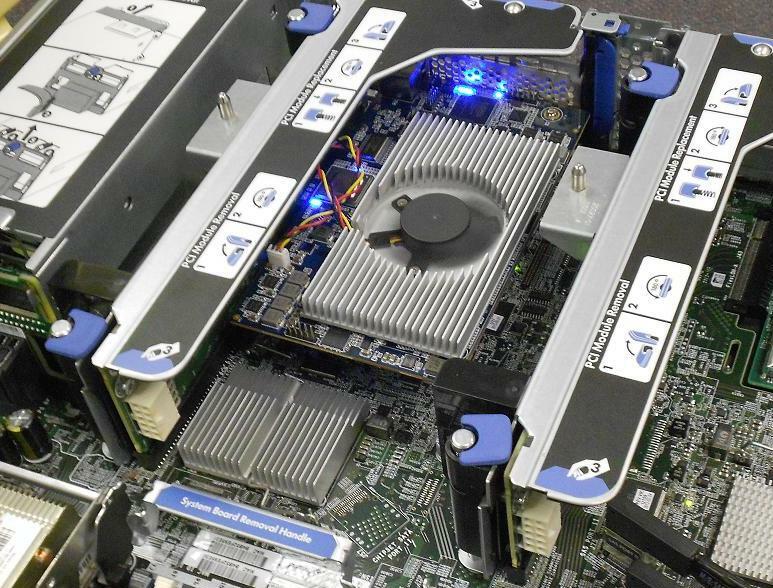 CIM technology targets HPC applications in general, providing a low SWaP (size, weight, and power consumption) alternative to GPUs. SigMRF is a telecom focused subset of the HPC applications supported by CIM. In the "Encode, Decode, or Both" column, a "B" means both encode and decode (typical transocde situation). A nominal framework overhead percentage of 30% is shown. This can vary, for instance higher overhead with heavier echo cancellation load. An Excel spreadsheet version of the table is available under NDA, allowing number of cores, overhead percentage, and transcoding combinations to be varied. 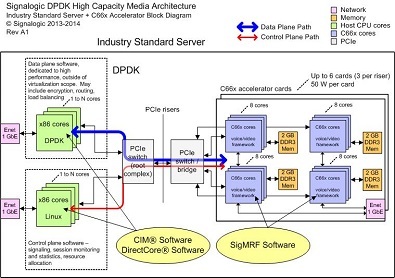 The block diagram below shows a high-throughput, low latency "data plane path" (blue line) between x86 cores and data plane media processing cores. In this example, control plane processing is handled by x86 cores running Linux, and control plane related coordination follows the "control plane path" (red line). If the machine is virtualized, data plane processing -- including Ethernet I/O on the accelerator cards -- would not be visible to the VM.